High Tea at the Shangri-La Hotel, Tokyo in the opulent Lobby Lounge is a wonderful way to experience the height of Japanese hospitality all while taking in the breathtaking views of downtown Tokyo. The Shangri-La is located in Marunouchi, the business district of Chiyoda, Tokyo and a short stroll from the East Gardens of the Imperial Palace. The Lobby Lounge is a real oasis of calm and peace and one would have no idea that they are in fact above the busiest railway station in Japan. From the 28th level of the luxury 5-star hotel my party and I felt like royalty as service staff guided us past the floor to ceiling windows to golden and cream-coloured sofas in the centre of the lounge where our polished tabletop and silverware glistened. The tastefully designed teaware also stood out and I learnt that the brand was in fact a Japanese one, “Noritake”. The pristine floral cups and saucers were brought to life by real adorning orchards arranged beside them. There was even a grand piano being played by an exceptional pianist against the backdrop of the lavish bar. Couples and singles, businessmen and mother’s groups – all dressed immaculately – neighboured us and were seated facing the sweeping views of skyscraper central. 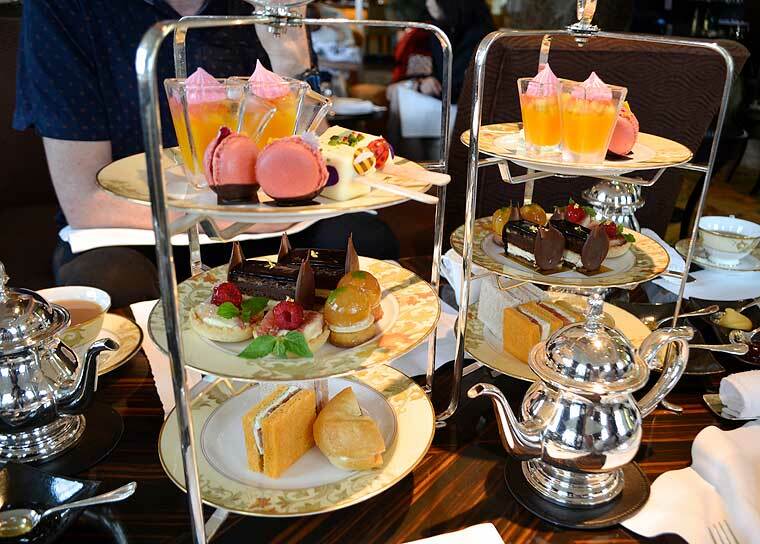 Rather than paying an entry fee at the Metropolitan Office Tower, high tea gave us the view with our meal. As well as being in the centre of the room my party felt we were also the centre of attention as our lovely waitress bowed to us and handed us the extensive tea menu. One of us opted for the Garden of Eden tea and I could smell the mango deliciousness the moment it was poured! Upon savouring it I felt that the passion fruit-packed and fruity flavour was perfect for the summer’s day, just heavenly! For myself I chose the Assam Gold. With origins from the cooler dry northern region of India this rich and malty infusion didn’t need milk. However this is recommended. 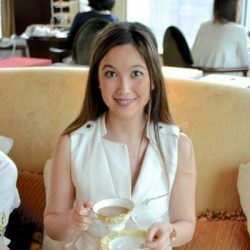 Please don’t eat lunch before venturing to the Shangri-La’s High Tea. As if the three-tiered stand crammed with savoury and sweet treats isn’t enough to satiate your appetite, a bundle of scones is also provided, served with four set condiments supplemented with a selection of other sauces and jams presented by your attentive host from a trolley. What is really exciting about the generous menu is the executive pastry chef behind it. Naoya Okamura has an impressive resume with 20-years experience as a pastry chef at the Pierre Hermé Paris boutique within the Hotel New Otani, Tokyo. His career further blossomed when he became a pasty chef at La Tour d’Argent Tokyo. It was here that he mastered the art of creating sophisticated French pastries. 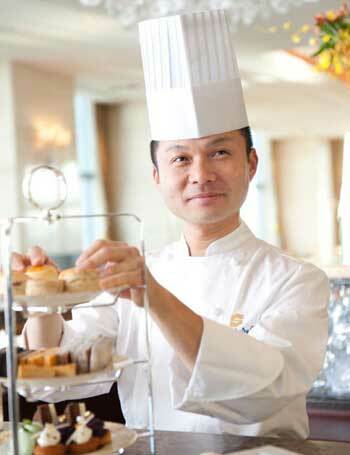 In March 2013, he was appointed executive pastry chef at Shangri-La, Hotel Tokyo. Okamura’s repertoire of pastries varies from classical desserts to innovative sweets that incorporate flavours and ingredients to suit the Japanese palette. His artistic endeavour is mirrored in the unique flavours and designs of the Shangri-La Hotel. His specialties include afternoon tea so my party and I knew we were in good hands. As tradition goes, we started with the sandwiches on the bottom tier. I enjoyed the classic Smoked Salmon and Sour Cream Bagel but we all loved the soft and creamy mozzarella with tomatoes and herbaceous butter in spiced paprika bread, just perfect! Our sweet favourites were the Madagascar Vanilla Mousse presented like an ice cream, which defies gravity as it holds together despite being so light and creamy. Not only was this a pleasure to taste but also exciting to look at with edible ladybugs and bees and a pistachio crumb on top. What is a high tea without some chocolate indulgence? For me the decadent Classic Opera cake did not disappoint. The smooth and rich marriage of ganache and coffee syrup was pure delight. 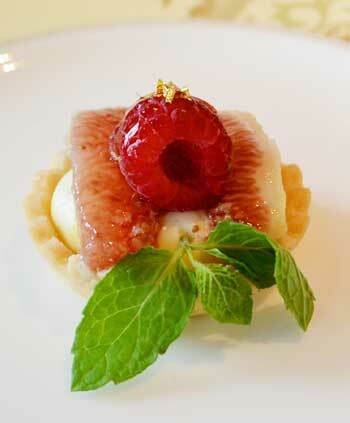 A standout sensation was without question the raspberry and fig tart. The combination of tartness from the fresh raspberry and sweetness of the fig was enough to reset my palate. This was complimented by mint and gold leaf garnishing, which added both interest and impressiveness. The condiments for our scones were plenty and included unique toppings such as peach and apple jams. We also enjoyed the classic lemon sauce, strawberry jam and clotted cream ¬– all familiar and delicious tastes and textures. What really had my attention was the crystallized honey. We also had the option of the usual sticky sweetener however I pleasantly discovered that the thicker and cloudy-coloured alternative was easier to spread. As for the scones I found myself longing for the traditional Australian-style big, light and fluffy clouds I have grown up with. What we were served were on the smaller and denser side. Despite this we still enjoyed the concluding course of our meal. On our way out we noticed an elaborate presentation of additional sweets. One type took a pineapple appearance and the other was served in a cocktail glass. This buffet service is perfect for anyone looking for something extra to nibble by the bar. The price is subject to consumption tax and 15% service charge.